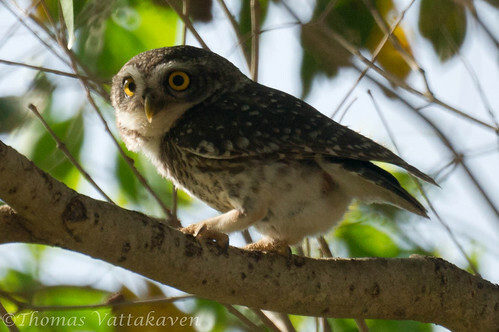 The Spotted Owlet (Athene brama) is a small owl that is fairly common in Southern India. 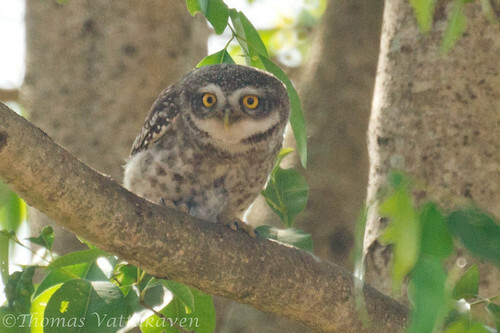 It is about the same size as the Barred Jungle Owlet featured here earlier. The sexes are alike and the prominent features of the bird are the white around the eyes and forehead. The upper parts, wings and tail is greyish to earthy-brown. The top of the head has small white spots, the rest of the upper plumage is more or less boldly spotted and in places almost barred with white. It has an indistinct whitish half-collar on the hind neck. The iris is pale golden-yellow and bill and feet greenish-yellow. 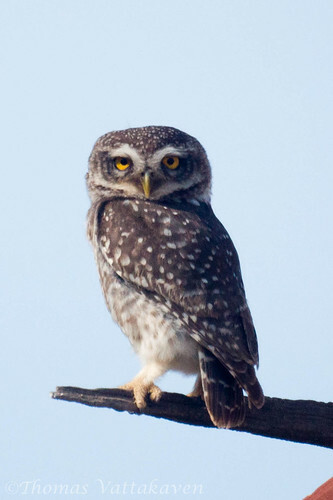 The facial disc is very indistinct in this owl. They are generally found everywhere, especially in gardens about houses, in twos and threes. 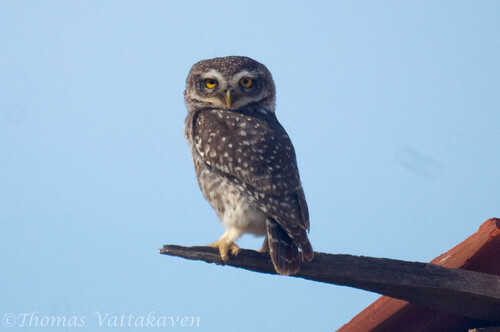 They are known to be wide awake during the day, and are known to make extraordinary noises at dusk. 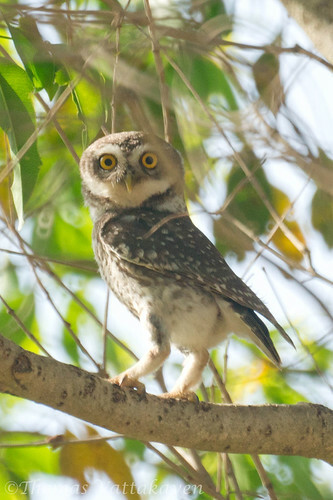 It is probably the commonest and most familiar owl in India. It is nocturnal in its habits. After spending its day in its hole, its emergence is often signalled by weird screeching calls before it takes off on hunting trips. They are known to be capable of hovering. Three – four individuals often live together. The food generally consists of beetles and crickets. Small animals and lizards are also taken. The breeding season is November to April. They nest in cavities or holes, often competing with other birds such as Mynas. the nest is often lined with leaves and feathers. Typically 3-4 eggs are laid. 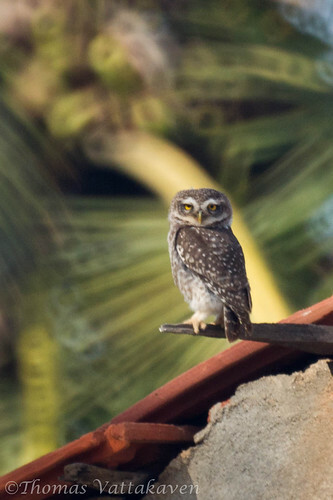 Other Details: Seen singly, sitting atop a tiled roof. After I got a bit too close, it began bobbing its head up and down and flew into a nearby tree, from where it continued to watch me.